Chicken and Vegetable skewers are one of my favorite things to make. I love meals where I can take care of the protein and vegetables in one-shot. These skewers are often called kabobs or shish kabobs in middle eastern cuisine and as part of Mediterranean food. 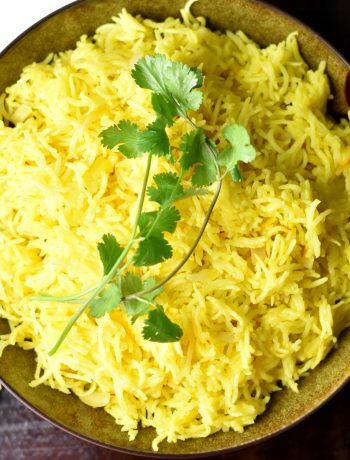 Depending on my family’s mood, we eat it with a garden salad, or with toasted Pitas and Hummus, and of course, one of our favorite combinations is with delicious and fragrant Lemon Rice! These kabob skewers are great as appetizer skewers as well; easy finger food for entertaining! This meal is super quick to put together too, which makes it very weeknight friendly. I buy pre-cut chicken from Trader Joe’s. I rinse and soak my basmati rice while I prep the vegetables. Dice up some onions, bell peppers and zucchini. Make a marinade with greek yogurt and dry spices. Toss chicken and veggies in the marinade and thread them onto bamboo skewers (best wooden skewers to use). I typically end up broiling these chicken skewers, simply due to a texture preference. I elaborate more on this point in the next paragraph. Simultaneously, set the rice in the Instant Pot. In the end, this meal is at the table in under 30 minutes. 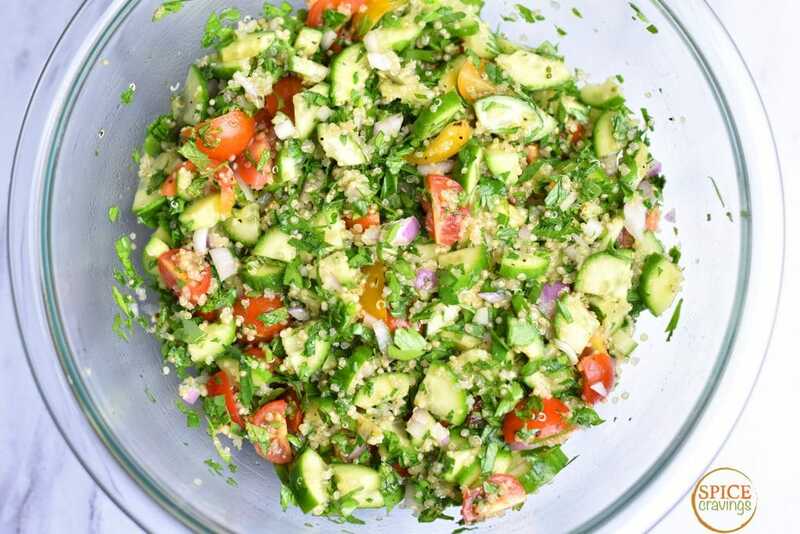 I serve this with a Garden Salad with a lemon vinaigrette or a Greek salad sometimes. You can make these kabobs with ground beef or lamb too to make meat skewers. 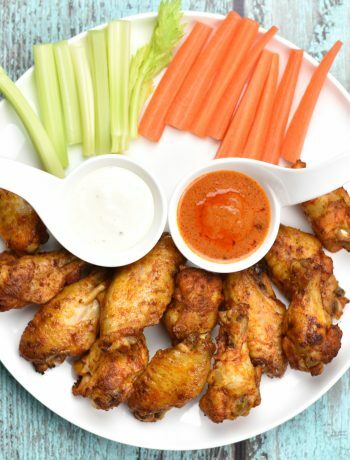 Grilling or Broiling: If you grill them or broil them in the oven, there is subtle charbroiled flavor that gets infused in the chicken and vegetables. The vegetables get cooked, but not all the way through and still retain their crunch. Instant Pot Pressure Cooker: If you cook your skewers in the pressure cooker along with the Lemon rice, the chicken will be super moist and the vegetables will be tender, more like a steamed texture. You can choose vegetables that take a longer time cook, like turnips, carrots, potato cubes instead. My family prefers grilling or broiling these kabob skewers. 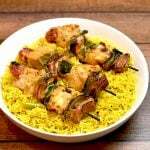 To make an all-vegetarian skewer version of this dish, you can substitute chicken cubes with Paneer cubes or Extra-Firm Tofu cubes. Follow the kabob recipe and marination process. If grilling them, reduce the time to 2-3 minutes per side, flipping them once. 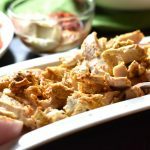 The spice quantities and choice in this recipe work great for my family, but feel free to adjust them based on your taste buds! 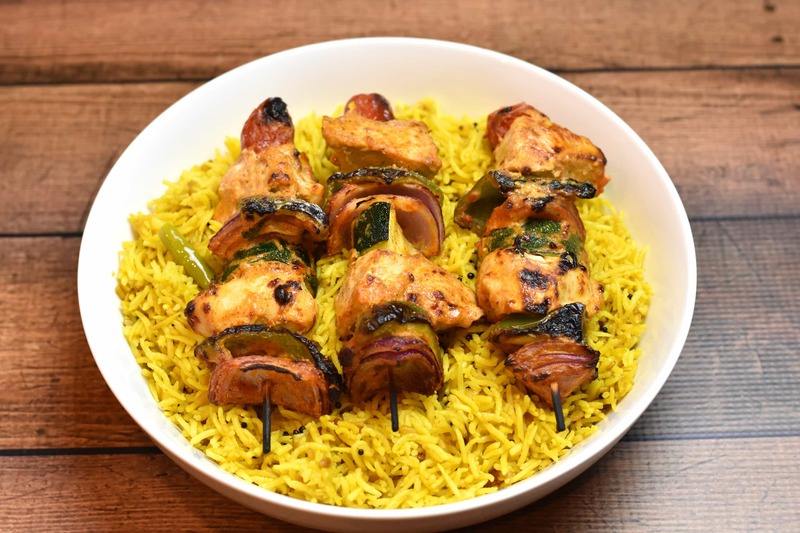 If you’re not into rice, or want to make a low-carb meal with this Chicken Skewers recipe, pair these kebabs with any of your favorite salad. 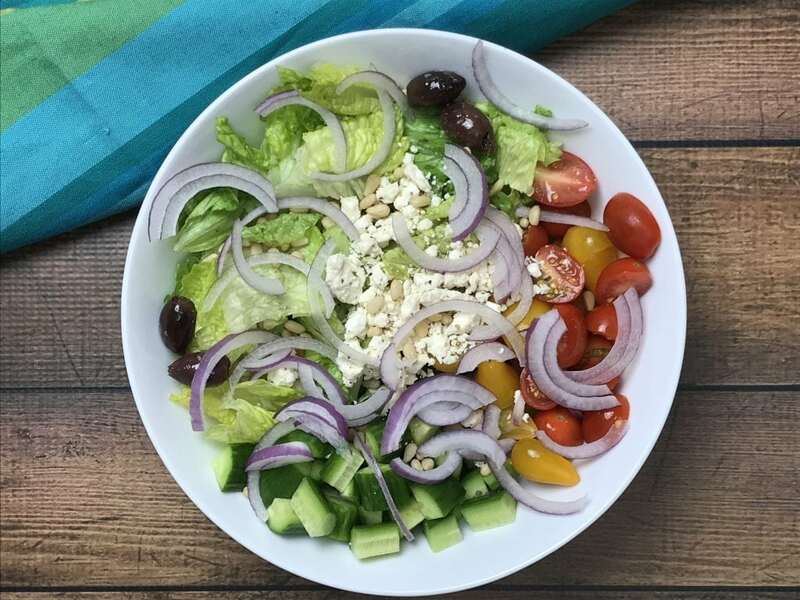 My husband and I have it with a simple Greek Salad and this combination makes for one satisfying and delicious meal! These Chicken Skewers go really with a side of Quinoa Tabbouleh too! Chicken and Vegetable skewers are a great combo of protein and vegetables. The chicken can be grilled, broiled, or cooked in an instant pot. 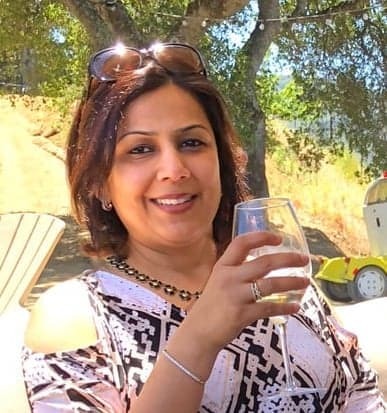 Depending on my family's mood, we pair it with saffron rice, or with a garden salad, or with toasted pitas and hummus. These skewers make for great finger foods for entertaining as well! Prep: Rinse and soak rice while you prep the vegetables and make marinade. Cut chicken in 1 inch pieces. Cut your choice of vegetables in a similar size. Build your Skewers: Make marinade by mixing together all ingredients listed under "Marinade". Add chicken and vegetables and toss well. Thread the pieces on bamboo skewers, alternating between chicken and vegetables. One-Pot Meal: Cook them in the Instant Pot with the Lemon rice, using the trivet as shown in the video. 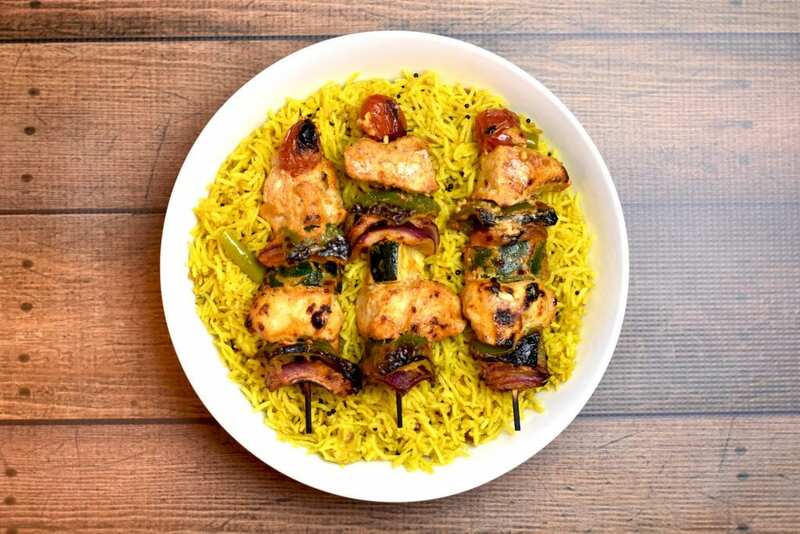 You can stack the skewers on a trivet, on top of the rice. Set Manual/Pressure cook for 6 minutes, with vent at Sealing position. Manually release pressure after 5 to 10 minutes (NPR 5 or NPR10). Lemon Rice: Here's the recipe for Lemon Rice. For low carb / keto, pair with a Greek salad instead.